"Costanoan by early Spanish colonists, are a Native American people of the Northern California coast. When Spanish explorers and missionaries arrived in the late 18th century, the Ohlone (named costanoans by the spanish colony), inhabited the area along the coast from San Francisco Bay through Monterey Bay to the lower Salinas Valley". - Pastel. 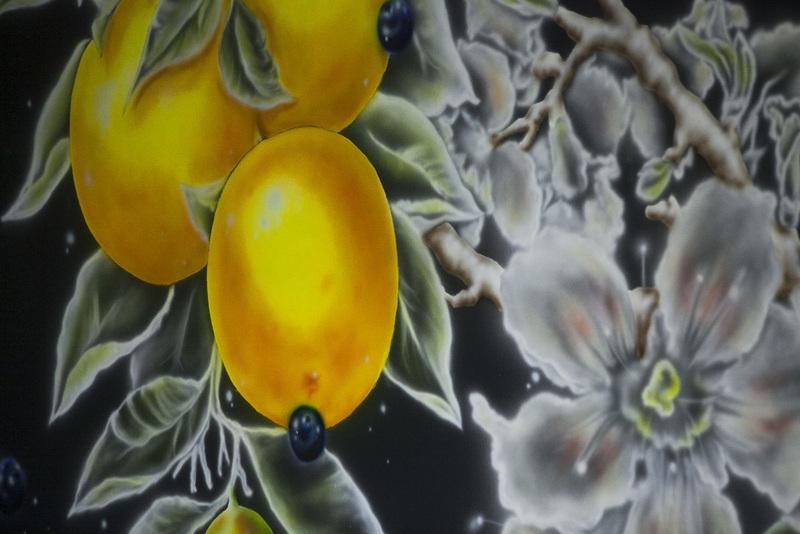 We're excited to announce the completion of Francisco Diaz aka Pastel latest mural. Pastel, Francisco Diaz is a painter based out of Buenos Aires, Argentina . One of four projects scheduled with the city of San Leandro. The mural is over three hundred feet long and around 30 ft tall it is located off the side of Highway 880 at Marina West Exit . Athen B. 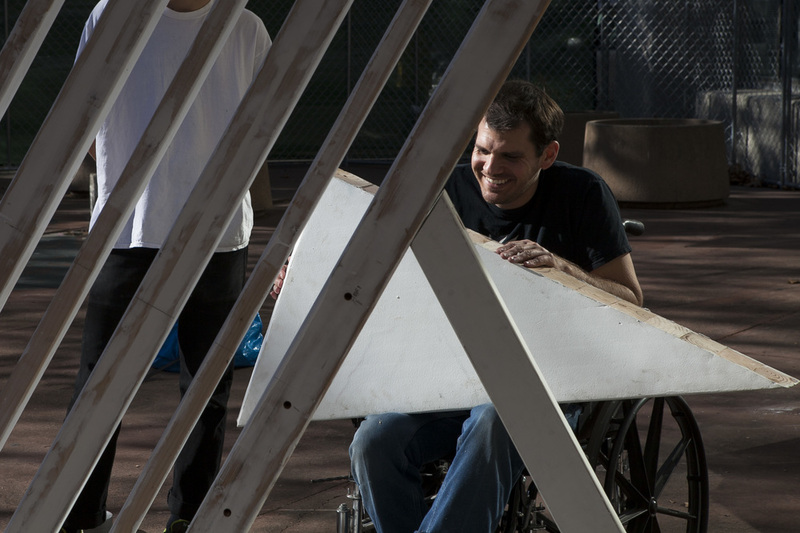 Gallery is excited to announce that we just started a project series of 4 walls with the city of San Leandro, CA. First up was Oakland Artist Kelly Ording. The mural is compiled of 5 different reds that break apart the bright blue background. The mural itself brings a lot of life into a neighborhood that lacks color. Located on Arnerich Automotive Service who has been living and working on the same street he was raised on. We were excited to work with Kelly on bring some life into the local business such as Arnerich Automotive Service located at 14995 Farnsworth St. San Leandro, CA 94579. 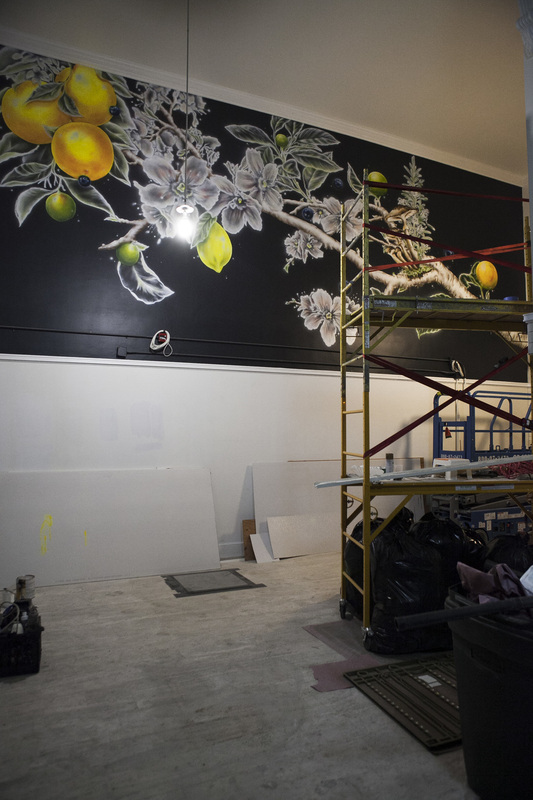 February 2017 | Cannon Dill's monochromatic mural is located in Oakland at 41st and Broadway on the side of the soon to open Copper Spoon Restaurant formerly known as Art's Crab Shack. 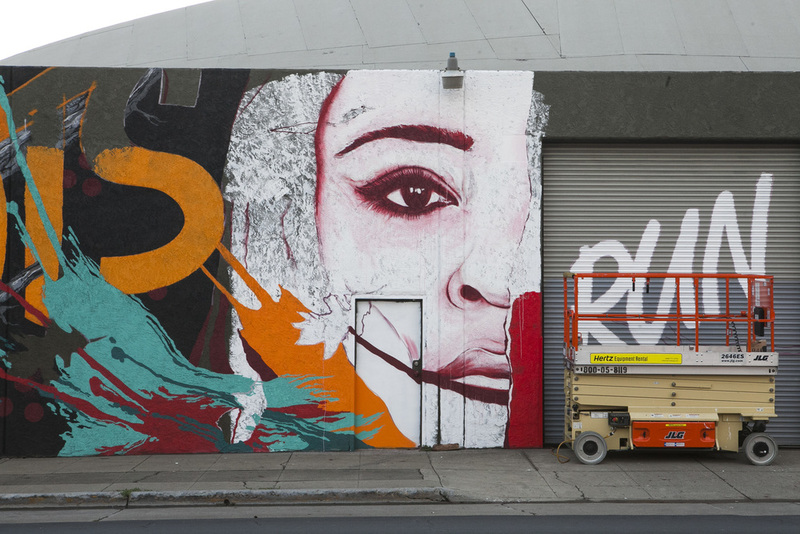 February 2017 | Joshua Mays mural is located on 40th and Broadway on the back side of Copper Spoon in Downtown Oakland. August, 2016 | Heather Day completed a large mural located on the side of Flax newly opened art supplies store in Downtown Oakland! This is the first time Heather's bright, bold and beautiful abstract work has graced public walls and we couldn't be happier its with us in Oakland. It is located at 15th and M.L.K. Jr. Way. July, 2016 | “There’s More to Green than Money” created by Jet Martinez on the side of the legendary I Magnum Building on 20th St. between Broadway St. and Telegraph in the heart of Downtown Oakland. April, 2016 | "Sei Movimenti" or "Six Movements" a large beautiful mural by Italian based artist Martina Merlini in Oakland's Jack London District with us at Athen B. Gallery. The mural was created in harmony with the group exhibition "Ready, Set" by Martina, Brett Flanigan and Heather Day at Athen B. Gallery. 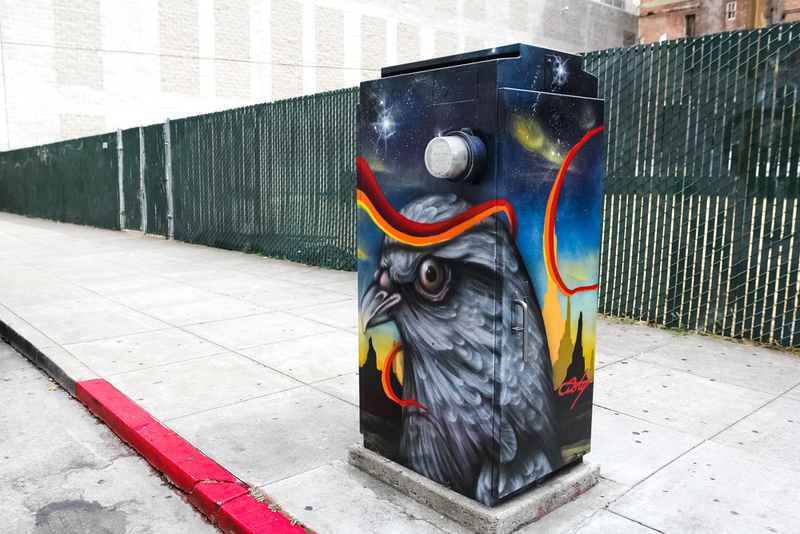 The mural is located on 4th and Washington in Oakland, CA. FEBRUARY 2016 | I am human through the reflection of your humanity back at me. 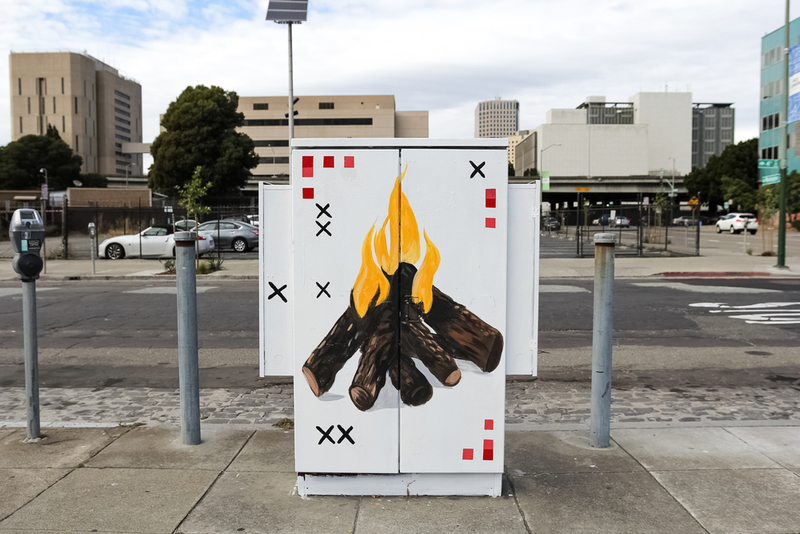 We're very excited to be working with RVCA sponsored artist Ricky Lee Gordon in Downtown Oakland on such a large beautiful wall as part of their Artist Network Program. 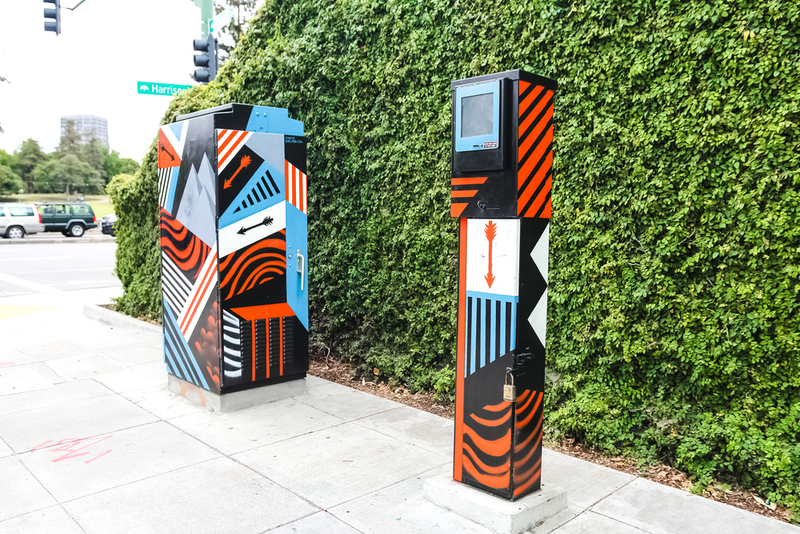 The wall can be viewed on the side of 21 Club on 21st and Franklin St or Broadway St.
Oakland based artist Brett Flanigan completed his largest sculpture / mural to date as part of our Artist Initiative project with the good people over at VSCO. 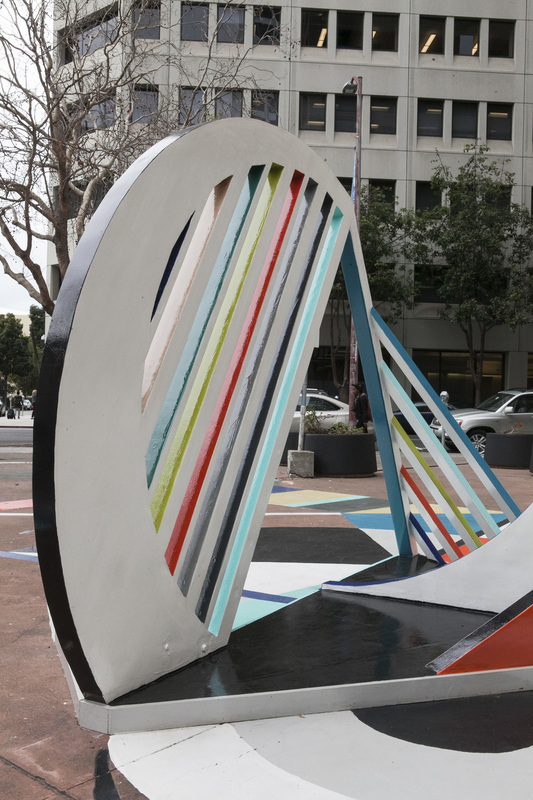 The project consist of three large walls by three local artist in the heart of Downtown Oakland and this plaza / sculpture installation can be viewed at 21st and Webster St. A huge thanks to Mua Resturant for allowing us to work on your property. Over the past couple of months Athen B. 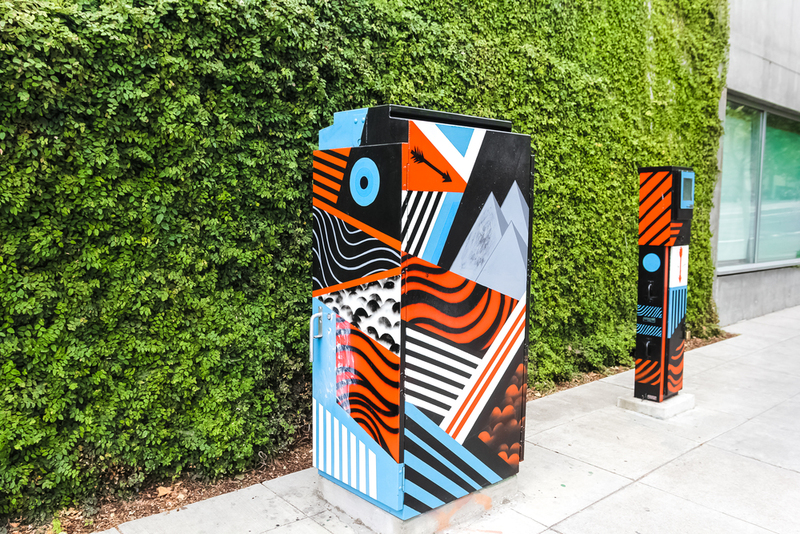 Gallery has been working with Oakland and Jack London Square on a series of custom painted utility boxes by local artists. Below you can see where all of the boxes are located and who painted them! NOVEMBER 2015 | Athen B. 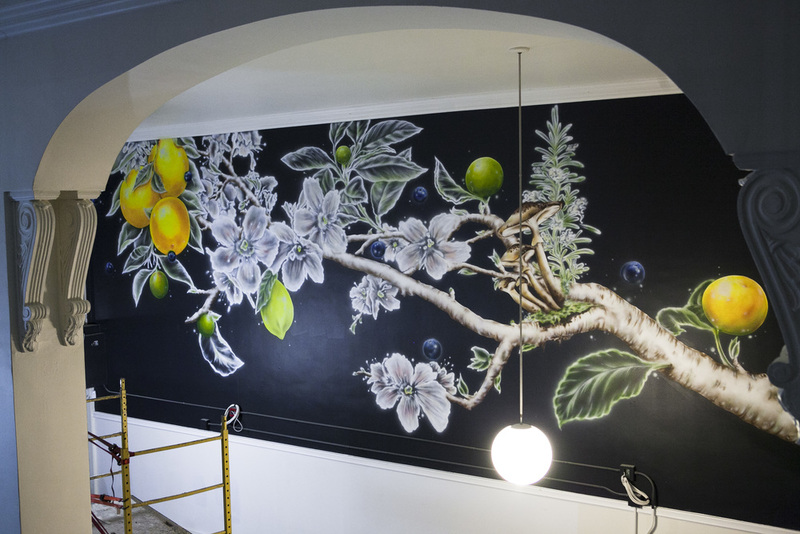 Studio artist Jack Chappel aka Nice One finished a mural inside of the now open Howden Market in Downtown Oakland next to Spice Monkey Restaurant on Webster and 17th St.
OCTOBER 2015 | We worked with artist Ricky Watts to paint a mural in the offices of Pitch Interactive in Downtown Oakland. 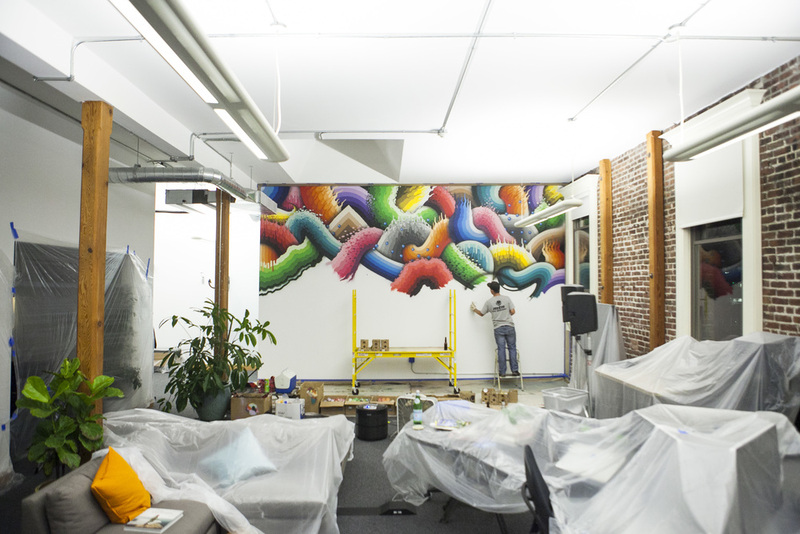 AUGUST 2015 | We teamed up with local artist David Polka to work on a new mural for Richard and Ben Weinstein's offices in Downtown Oakland. 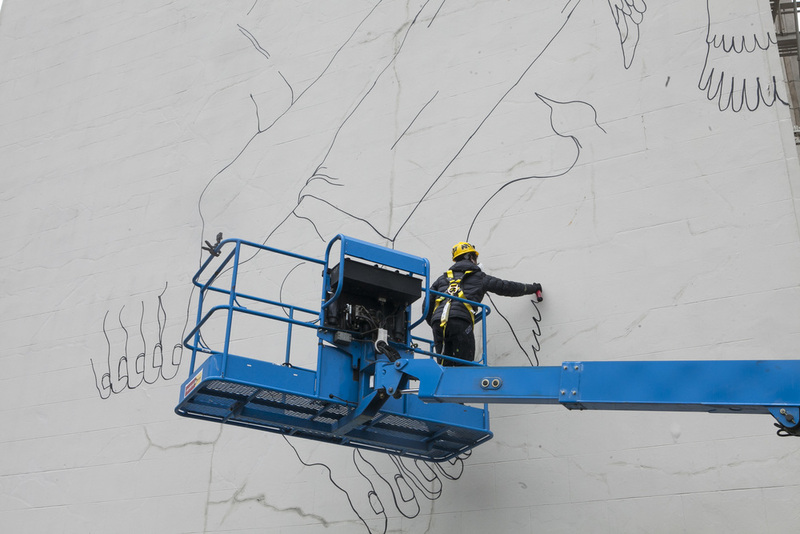 JULY 2015 | Oakland based artist Cannon Dill completed his largest mural to date as part of our Artist Initiative project with the good people over at VSCO. 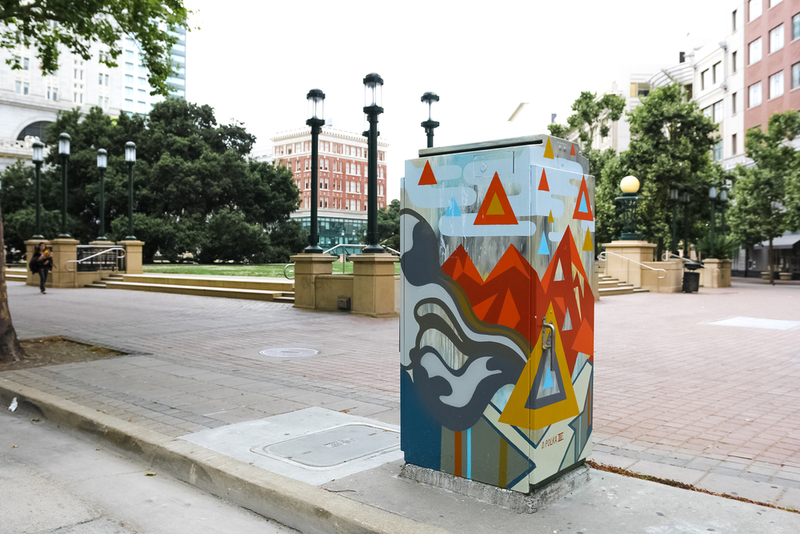 The project consist of three large walls by three local artist in the heart of Downtown Oakland. A special thanks for Bay Area Legal Aid for all the help and letting us paint your wall!! 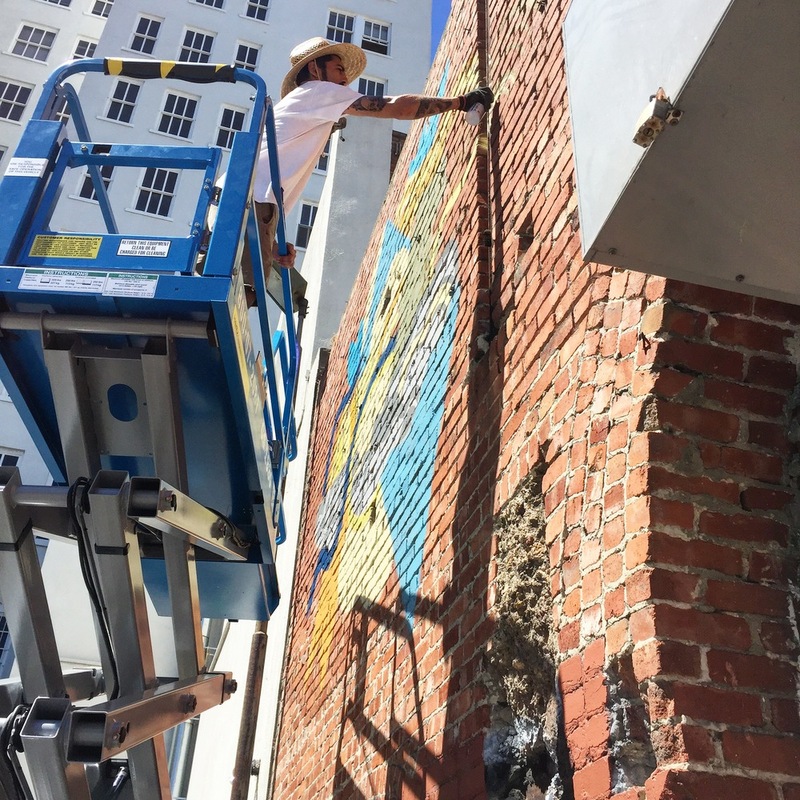 JUNE 2015 | We had the pleasure of working with Bay Area artist Zio Ziegler and the United Nations on a large scale mural on the historic Cathedral Building in Downtown Oakland. 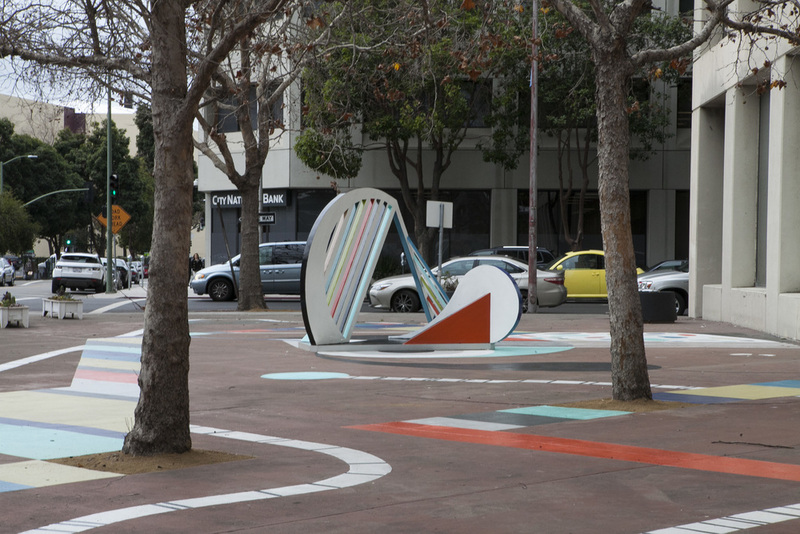 The mural was painted for the UN's seventieth anniversary taking place in San Francisco at the end of the month. We're excited to have the one and only MEGGS join our line up of murals this past week in Oakland before our Grand Opening of Athen B. Gallery on June 13th. Although we're new to the community as Athen B. Gallery, we've been working behind the scenes with some of your favorite artist from around the world the past five years. MEGGS is one of those artist that has long ago joined our weird little art family. We were more than thrilled to get him on a nice big wall with the good people at Mr. Espresso in Oakland's Jack London Square area on 3rd and MLK. JUNE 2015 | Athen B. Gallery is proud to announce our partnership with Oakland based VSCO as their latest Artist Initiative project. 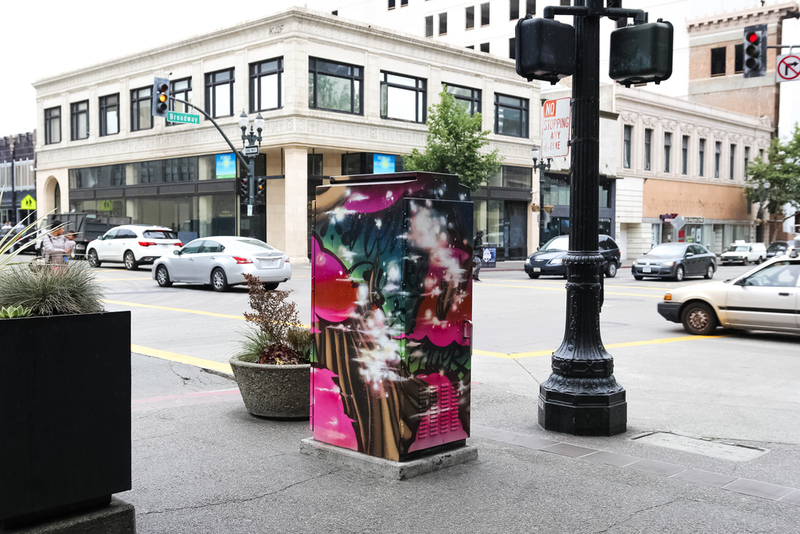 The project consist of three large walls by three local artist in the heart of Downtown Oakland. To get the project started we selected Ernest Doty and Ryan Montoya to team up together on this massive wall located on Oak and 5th in Oakland.